92mm wire fan guards at GardTec are durably built to protect cooling fans from damage by foreign objects or fingers. This 92mm fan guard is steel and nickel chrome plated for long lasting fan protection. Wire fan guards are lightweight and let more airflow through than polyurethane foam filters. 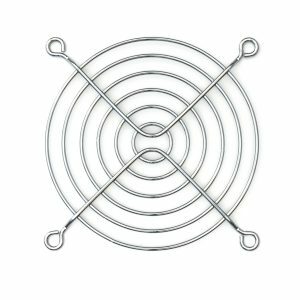 This wire fan guard measures 1.6mm for the ring diameter and 1.8mm for rib diameter. Purchase these reliable fan guards in bulk for great value. GardTec offers a great selection of reliable cabinet cooling fan kits and fan accessories.